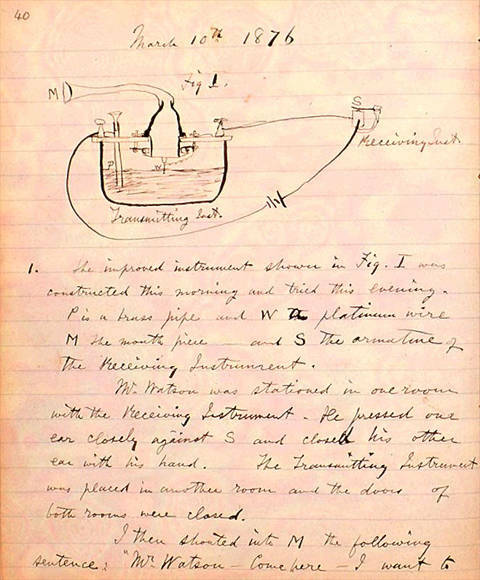 Alexander Graham Bell's Experimental Notebook, March 10, 1876. Source: Library of Congress. “Mr. Watson,” Alexander Graham Bell said into the mouthpiece, “come here — I want to see you.” Thomas Watson, Bell’s collaborator, heard the words in another room over the receiver. And the world’s first telephone call was complete. The grandson of an actor interested in speech disorders and the son of both a father who devised a method to teach the deaf to speak and a deaf woman who learned to play the piano, Alexander Graham Bell was born into a family fascinated by sound. His own interest in sound waves was paired with a rich speaking voice. Bell’s groundbreaking invention began with an error, however. Reading a thesis on sound written in German, a language he read poorly, left him with the belief that the author said sound could be transmitted over wires. While the paper said no such thing, the error set Bell to devise what eventually became the telephone. In his twenties, Bell relocated from Scotland to Boston, where he used his father’s method to teach deaf people to speak. While there, he met Watson, a mechanic of considerable skill. Working together, the two invented the telephone in a few years. Bell received a patent on March 7, 1876. Three days later, he and Watson demonstrated that the new device worked. Others had been working on similar inventions at the time, and Bell’s primacy with the invention was challenged. His claims were always upheld in court, however. Eventually, Bell formed the American Telephone and Telegraph Company, or AT&T, which dominated phone service in the United States until it was forced to break up in the 1980s. I worked as sound editor on the Canadian/New Zealand television feature, “The Sound and the Silence.” When the postproduction sound crew commenced the “come here…” scene had not been completed, and it was a little suspenseful, waiting to see how the director had depicted this famous event. We used the then new digital sound editing techniques, I’m sure Bell would have been fascinated. The series covers Bell’s life as related above and, I believe, is a faithful retelling of his story, including far more than the telephone work. I need a pic of the phone!! Bell actually lived in Canada for many years and did much of his research on inventing the telephone while living in Ontario before traveling to Boston. Bell also passed away while at his estate in Nova Scotia, Canada. It’s funny how Americans like to claim everything and everybody as their own. I’ll stick to Wikipedia in future.